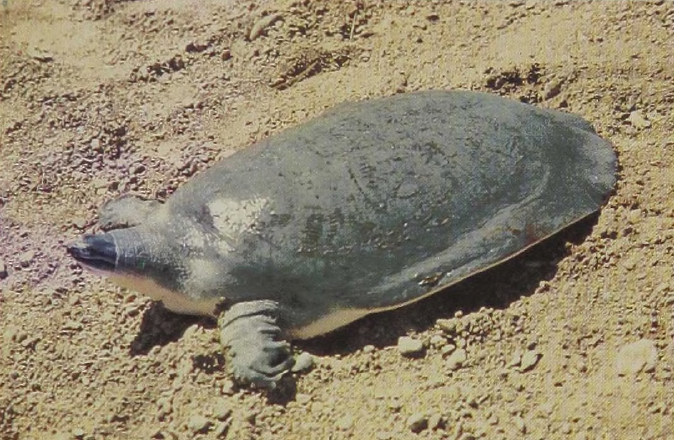 This curiously small-headed, soft-shelled turtle is clearly the largest species of its group. 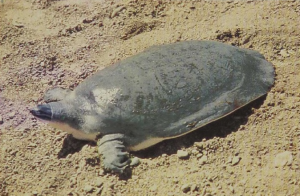 Annandale claimed that its shell approaches 6 feet in length and that the turtle was capable of attacking and sinking small boats (though presumably not doing much harm to the occupants). The brown shell is, at least in smaller specimens, marked with wavy lines, while the sides of the head are striped. The most astonishing aspect of the animal is the extremely small head. The skull seems even smaller than it really is because the eyes and nostrils are crammed onto its anteriormost portion. Clearly the animal is highly adapted for life in muddy rivers. Like some submarines, only the “periscope” and air intake need be exposed to aerial predators. The species lives in the large rivers of the Indian peninsula from Pakistan to Malaysia.